In a stunning combination of superb colour images and lively personal essays, Salmon Country takes us on an excursion along New Brunswick's famous salmon rivers. Marrying the words of Doug Underhill and the photographs of André Gallant, Salmon Country explores the people, the rivers, the traditions, history, and mythology of this sport of sports. And there's drama around every bend in the river. Underhill tells of becoming one with the river, of treading deep pools, of wading shallow rapids and gravely shoals in search of the king of fish. Gallant shows the splashy thrill of the catch, breathtaking treecanopied rivers, and the people who make the experience memorable. Written with keen observation, wit, and verve, Salmon Country brings to life a world centred on fly-fishing and pays tribute to all who share the joy of fishing the Miramichi, Restigouche, Nepisguit, Cains, and Saint John rivers. Published by Henry Flood of Neptune Publishing of Saint John, NB, the book has an overview chapter on "Baseball in Miramichi." Then the book divides in various sections. The first is titled "The Pro" and features Jason Dickson. The second section is "Minor Pros" and highlights Art Leggatt, Richard Leggatt, Keith MacDonald and Neal Palmer. The third section concentrates on "Baseball Hall of Fame" with chapters on the 14 individuals who are in either the NB Baseball Hall of Fame and/or the NB Sports Hall of Fame. These cover Greg Morris, Cuffy McLaughlin, Pat (Pic) Chambers, Burns Vickers, Billy Daley, Blaine Silliker, Waldo Henderson, Ken Cripps, Walter Vautour, Terry Whalen Sr., Billy O’Donnell, Bev Bawn, Guy Sorel and Lorne Whalen. The next section has what Underhill calls "The College Kids"- players who have "gone south to play. There are 19 chapters focusing on the following individuals: John Cann, Michael Dunnett, Terry Morris, Jamie Wood, Stephen MacFarlane, Aaron Brideau, Derrick McKibbon, Kevin LeBlanc (Rogersville), Chris Burns, David Godfrey, Heath Stewart, Derek Finnigan (Rogersville), Chris Noel, Mark Dunnett, Stephane Comeau, Darren Hardy, Brad MacMillan, Matt Jenkins and Jamie Jenkins. These chapters are followed by "The Scouts" covering the four Miramichiers who have /are scouting for Major League teams. Underhill concludes the baseball section with a chapter on the "Storied Tradition of Ironmen Field." This looks at the history and atmosphere that surrounds Miramichi’s own "Little Green Monster." The Softball section begins with an overview of the history of softball in the Miramichi. Then it moves to the nine "Hall of Fame" people. These include Paul Dawson, Wendy Dealy, Donald Ross, Clarence (Junior) MacDonald, Peter McLean, Peter Manderson, Thomas Lanteigne Tim McCarthy and the Nelson Softball Association. The tenth chapter features Ricky Bryenton who played in a World Tournament. The next section deals with the three Miramichi teams that have been inducted into the Halls of fame. These are the 1975 Chatham Ironmen, 1956 Chatham Head Tigers and the Loggieville Bisons. The last chapter is a tribute to the people who make the games happen- The Umpires. This covers many of those who have regularly umpired baseball and/or softball games along the river. 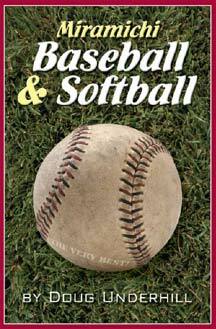 The cover features a ball on a background of green grass. On the ball is written "The Very Best." "This is one of the trade-mark expressions that make Miramichiers so interesting to listen to, and it also a tribute to those included in the book." said Underhill. 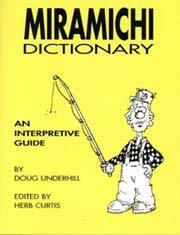 Miramichi Dictionary: Laugh and learn as you experience the "Special Language of Miramichi" as you have heard it spoken, or are hearing it for the first time. Pummesoltagod, shes the "Very Best" as they say. "Hello for a Good Time !" A Best-Seller by Canadian standards with over 8,000 copies sold.